Hello Piscators and Piscatrixes, this is the next occasional fishing thread. Occasional in this context means every three Saturdays at pretty much this time. For this edition I have decided to steal ideas from other threads. I will also suggest a theme, which as always is a jumping off point. All things fishy are on topic. The first steal: Who Dis? I went back and forth between “what have you seen out there?” and “the one that got away” for tonight’s theme. I’m going to tell a what I’ve seen story but the one that got away stories are good too. One of the best nights of fishing I ever had I got skunked. I was kayaking out to Nauset Spit in late summer when there was fire in the water. That’s a term for phosphorescence, or what the smarty pants call bioluminescent diatoms. The water glows when you touch it. On this night the water glowed with every stroke of the kayak paddle. Fish that were spooked from the undercut banks took off like fire torpedos. When I beached the kayak the sand was wet and every step I took lit up like the Billie Jean video. And then there were the Perseids. It was moonless, the Milky Way was showing off like a ripe young barista, then here come the meteors. God was absolutely showing off what he could do with light. I didn’t mind not catching anything. So what have you seen out there? 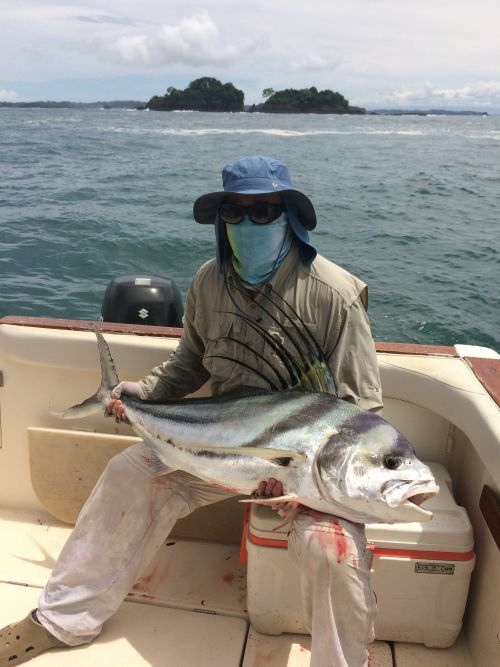 The second steal: a la the Pet Thread various Morons and Lurkers have sent in fish brag pics. As with the pet thread I got too many to handle so please be patient if you don’t see yours. I think the fish brag pics will be a continuing but not constant feature of the Occasional Fishing Thread. Last fishing thread you mentioned that Eric Clapton had most likely got an old hatchery fish from the pic, it could be but I don’t think so. I’m pretty sure that fish was wild. He was fishing in Iceland and they have some interesting rules, like everything is catch and release. The wife and I went to Iceland on a kinda cultural exchange thing (her ancestry is Icelandic) a year ago. Well, besides finding the old farmstead where her great, great, great, umptity, ump grands homesteaded in 874 (NOT a typo!) I got a chance to do some fly fishing for Icelandic Browns. A tad pricey, but, you only live once. Muad’dib’s kid caught a dinosaur. 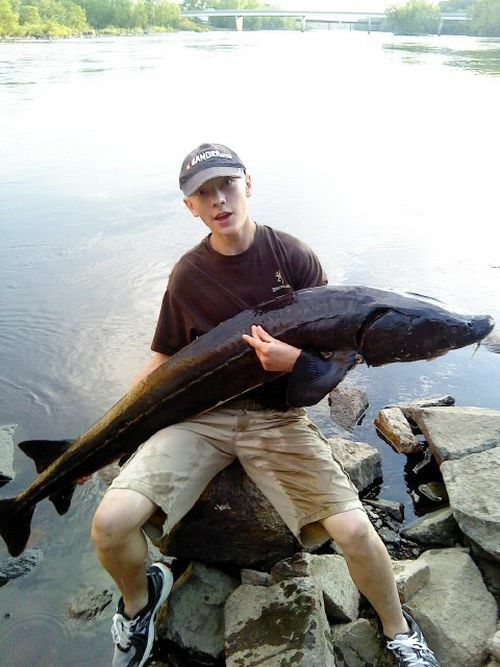 Youngest son with a 72" sturgeon. Caught in the Chippewa River near Chippewa Falls. Lurker Jeff will not let the terrorists track him down. 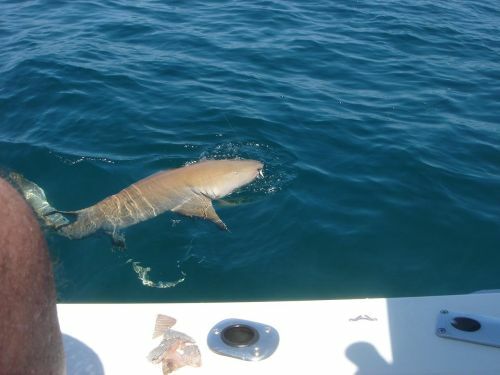 My name is Tony and I would like to share a pic of a Nurse Shark I caught off the west coast of Florida while fishing for Grunts. I was fishing in about 250 feet of water over a rocky bottom which my guide took me too. I was using 20lb test line as well, it felt like I had hooked the bottom, and it took me all of 45 minutes to bring this fish to the surface. The Captain was amazed that the line didn't break, and when I asked him about the fish, he told me it was at least an 8 foot, 300lb shark. Biggest fish I have ever caught so far. Most painful as well because the next day I ached all over from horsing this fish from the bottom. This is not a joke, this is a legitimate brag pic. It means that there are wild spawning brook trout on a stream that is heavily stocked and gets heavy fishing pressure. Wild brookies are among the prettiest things in the world. I caught this. Thank you as always for playing in the fishy thread. Suggestions and brag pics are welcome at aoshqfish@gmail.com.